To support business agility, IT managers generally want to be able to execute projects quickly and efficiently, but circumstances can often conspire against them. Virtualization now offers managers the ability to execute the deployment and scaling of IT systems quickly to support agile business initiatives. This paper examines the distinctive capabilities of a virtual server infrastructure that combines VMware software, AMD OpteronT multi-core processors, and HP ProLiant Servers. This combination presents a uniquely powerful mix of rapid deployment cycles, agile virtualization capacity, and performance-delivering the ultimate virtualization solution to help realize agile business execution. Many factors influence the outcomes of decisions aimed at increasing business agility. People are a significant factor, but IT is usually the primary element affecting the results of an agile business move. Success with IT is crucial for the realization of an operational change intended to affect an agile strategy. In this regard, developments in virtualization can offer business managers powerful new tools to make agile moves that can be executed quickly, economically, and inexpensively. Yet, not all virtualization technologies offer the same degree of agile execution potential. The combination of VMware and HP ProLiant servers powered by AMD OpteronT processors help deliver the best possible agile execution capability, with virtualization "in the silicon" and a server platform built for agile virtualization. It's the right IT choice for agile business execution. 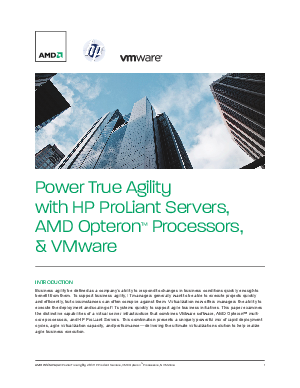 Download this whitepaper to learn more about business agility with HP ProLiant servers, AMD Opteron Processors and VMware.